Prior to 1995, the Minister of Petroleum in exercise of his discretion had been allotting retail outlets for petroleum products, LPG dealership and SKO dealership, without having any prescribed norms. CPIL, filed Public Interest Litigation in Supreme Court praying that guidelines to regulate the exercise of discretion in the matter of such allotment, which results in exercise of the discretion arbitrarily be fixed. The Court issued a set of guidelines for discretionary allotment of petroleum products agencies to ensure that the exercise of discretion in making such allotments are in conformity with the rule of law and by excluding the likelihood of arbitrariness and minimising the area of discretion. CPIL challenged the decision of the Government to sell majority of shares in Hindustan Petroleum Corporation Limited (HPCL) and Bharat Petroleum Corporation Limited (BPCL) to private parties without Parliamentary approval or sanction. 3. 2005: Neera Yadav removed from Chief Secretary post. This Petition was filed by CPIL challenging the appointment of Neera Yadav as the Chief Secretary of Uttar Pradesh despite there being several corruption cases pending against her. She was ordered to be removed from the post of the Chief Secretary by the Court vide judgment reported in (2005) 8 SCC 202. The CPIL had challenged legality of the appointment of Shri P.J. Thomas as Central Vigilance Commissioner under Section 4(1) of the Central Vigilance Commission Act, 2003. The Supreme Court held that recommendation of the High Powered Committee recommending the name of Shri P.J.Thomas as Central Vigilance Commissioner is non-est in law and, consequently, the appointment of P.J. Thomas as Central Vigilance Commissioner was quashed. The Delhi High Court had refused to entertain the writ petition filed by CPIL for a court monitored investigation by the Central Bureau of Investigation or a Special Investigating Team into what has been termed as ‘2G Spectrum Scam’ for unearthing the role of respondent No.5-Shri A. Raja, the then Union Minister for the Department of Telecommunications (DoT), senior officers of that department, middlemen, businessmen and others. The CPIL preferred appeal in Supreme Court. Three Judge Bench of Supreme Court directed the CBI to conduct the investigation without being influenced by any functionary, agency or instrumentality of the State and irrespective of the position, rank or status of the person to be investigated/probed. 6. 2012 : Cancellation of 2G Spectrum allocations. CPIL sought cancellation of 2G spectrum allocation and 122 telecom licenses awarded in 2008. The Court cancelled the entire allocation of 2G spectrum and 122 telecom licenses, and directed fresh auction vide its judgment reported in (2012) 3 SCC 1. 8. 2014 : Section 6A DSPE Act invalid. CPIL and Dr. Subramanian Swamy challenged Section 6A of Delhi Special Police Establishment Act which provides for obtaining the previous approval of the Central Government for conduct of any inquiry or investigation for any offence alleged to have been committed under the Prevention of Corruption Act, 1988 where allegations relate to officers of the level of Joint Secretary and above. 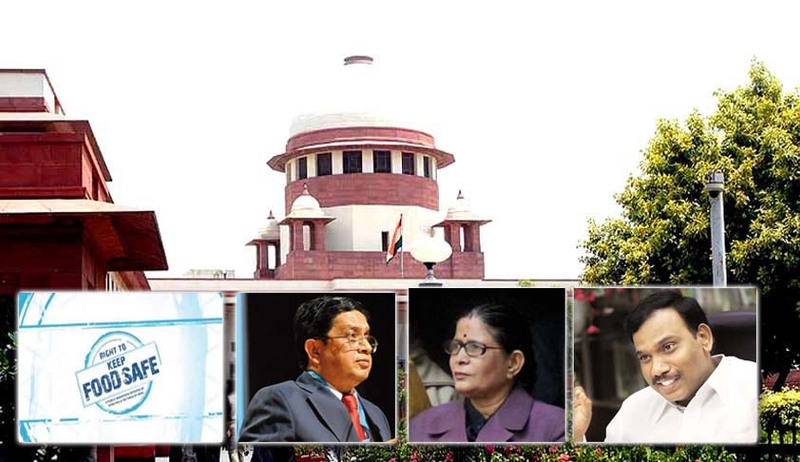 Three judge Bench of Supreme Court held that Section 6- A(1), which requires approval of the Central Government to conduct any inquiry or investigation into any offence alleged to have been committed under the PC Act, 1988 where such allegation relates to (a) the employees of the Central Government of the level of Joint Secretary and above and (b) such officers as are appointed by the Central Government in corporations established by or under any Central Act, government companies, societies and local authorities owned or controlled by the Government, is invalid and violative of Article 14 of the Constitution. CPIL approached Supreme Court in 2004 seeking directions and guidelines to check the misuse of thousands of crores of public funds which is taking place at the hands of the Central government, the State Governments, and the agencies and corporations controlled by them and by other public bodies, by means of advertisements issued in the print and electronic media which are being used to project personalities, political parties and particular governments. Petition has been allowed with specific directions to the Government for stopping misuse of public funds on such advertisements. 2. In CPIL v Registrar General of the High Court of Delhi, WP (C) 514/201, entire selection process and evaluation method adopted in Main (Written) Examination of Delhi Judicial Service, 2014 (DJS) was challenged on the grounds of being unreasonable, arbitrary and hence, in violation of Article 14 of the Constitution. The Court ordered for re-evaluation of the papers of those candidates who were successful in preliminary examination but were not called for interview. 3. CPIL V. Housing and Urban Development Corporation ∨s, CWP No. 573 of 2003, was filed by CPIL to bring to the notice of Supreme Court the action of the Officials of HUDCO in arbitrarily granting loans for political and extraneous considerations without going in to the merit of each case and even ignoring prescribed / established procedures, appraisal norms and financial prudence including the advice of Board members. The Court had referred the matter to the CVC for investigation and the CVC had submitted detailed report. 4. In CPIL V. UOI & ors CWP No. 180 of 2004 , CPIL challenged the constitutionality of the Presidential Order 1950 according to which only the members of scheduled castes from Hindu, Buddhist and Sikh religions are benefitted and the converts from Christianity/Islam are denied the benefits. The matter was referred by the Government to Justice Ranganath Mishra Commission in 2005. The Commission has submitted its report before the Court supporting the P’s prayers. 5. In CPIL v UOI, WP (C) 505 of 2012, the accountability of the government’s three intelligence agencies namely Intelligence Bureau (IB), Research and Analysis Wing (RAW) and National Technical Research Organisation (NTRO) which have been created by simply executive orders without any statutory support, was questioned. It was also sought for to set up of a proper mechanism, following the models of other democratic countries, so that accountability of these government’s could be ensured. The Court has issued notice. 6. In CPIL v Union of India & ors. CWP No. 991/2013, CPIL sought for a thorough and independent investigation into allegations of various misdemeanours and breach of laws by M/s. Price water house coopers Pvt. Ltd and their various network Audit Firms operating in India sharing the brand name of Pwc and providing audit and advisory services. In CWP 6426/2006, CPIL ∨s. Vs. UOI ∨s., a proper and complete investigation into the allegation of the involvement of the middlemen and payment of bribes in the procurement of Scorpene submarines was sought. The High Court directed the CBI to register PE. The CBI, pursuant to the said direction, filed its report in a sealed cover. The HC, on the basis of the said PE report but without sharing the same with the Petitioner, disposed of the writ petition. In CPIL vs UOI &Ors SLP (C) 25545 of 2012 The High Court has issued a notice following CPIL’s petition seeking for an investigation by a SIT/CBI into the purchase of over 100 aircrafts by Air India causing enormous loss to the national carrier. In CPIL v UOI, CWP 1815 of 2015 CPIL filed a writ petition before the High Court of Delhi seeking direction for expeditious investigation of corruption cases in AIIMS by the CBI, as well seeking disciplinary proceedings that were recommended by the former CVO, AIIMS. CVC and CBI have pursuant to the direction of the Court filed their respective status reports. In CPIL vs. Union of India WP (C) 8780/2009& 6813/2010 a writ of mandamus to the Union of India was filed by CPIL to make reference under Section 7 (1) of the Prasar Bharti (Broadcasting Corporation of India) Act, 1990 to the Supreme Court for holding an inquiry against Mr. Baljit Singh Lalli. Despite the fact that the CVC had clearly indicted the said CEO of the Prasar Bharti Board for various financial irregularities and misuse of his office, the govt. was not taking any consequent action. The High Court ordered CVC probe which found him guilty. This led to the Government initiating the process for his removal.